In this part, we make the case for why vulnerability management is a critical security control that all modern organizations must address. We look at the timeline of the Equifax breach and how the problems leading up to it can be attributed to poor vulnerability management practices. 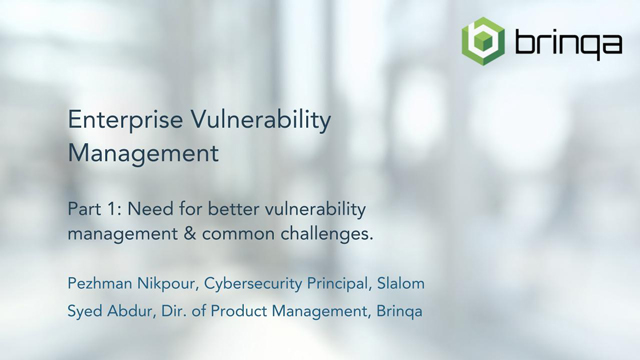 We also discuss common challenges that most organizations face when trying to implement a vulnerability management program. We’d love to answer all of your questions, you can email them to our host at troy.vera@brinqa.com to be answered by email, or tweet @brinqa with the hashtag of #BrinqaWebinars and we will cover everyone’s questions. In this session we will discuss how modern InfoSec organizations tackle the challenge of securing and protecting their software infrastructure. By taking a knowledge-driven and risk-centric approach, these organizations strategically leverage existing investment in security tools (SAST, DAST, Open Source, Penetration Testing, CMDB, Asset Management, Threat Intel, ITSM) to design application security programs that identify, prioritize and remediate vulnerabilities that pose the biggest threats to the organization — in a highly automated and efficient manner. We’d love to answer all of your questions by email, ask them during the session in the chat window, you can email them to me at troy.vera@brinqa.com to be answered by email, or tweet @brinqa with the hashtag of #BrinqaWebinars and we will cover everyone’s questions. In this part, we discuss the technical capabilities needed by vulnerability management programs to proactively protect an organization. We will look at the nuances of risk modeling, data connectors, automation, remediation and analytics as they apply to vulnerability management and discuss how they come together in an effective vulnerability management program. We will also present 10 rules of thumb that all solution architects must consider as they build vulnerability management programs for their organization. In this part, we present a case study detailing vulnerability management at a Fortune 100 Utility company. The case study describes the challenges faced by this large organization and how they were able to systematically address them to achieve vulnerability management success. We will discuss process improvements, key risk and performance metrics, and the risk prioritization model implemented to ensure that critical assets and business functions were protected. In this part, we discuss how modern cyber risk management programs address vulnerability management challenges. We will look at the benefits of taking knowledge-centric and risk-centric approaches to vulnerability management and how these impact your program structure and performance. We present knowledge graphs as a potential solution to vulnerability management woes and put forth critical questions of vulnerability risk that all organizations must answer. Business Exposure: What risks are different business entities exposed to due the vulnerabilities? The remediation gap is real. One of the largest retailers in the world, top 5 medical insurance firm, largest US electric utilities provider - these are just some of the industry leaders that rely on Brinqa Vulnerability Risk Management to secure their critical assets. How do these cybersecurity organizations - representing some of the most complex, diverse and vast technology ecosystems in the world - tackle the most pressing vulnerability management problems of today? In this webinar we discuss how these two innovative technologies work together to create a comprehensive web application security program that helps AppSec programs identify, prioritize, remediate and report the most imminent and impactful vulnerabilities in your organization's software infrastructure.